On a recent escape to the Big Apple, I met with James at analog/shift’s headquarters. He opened-up about where his passion for watches came from and also shared his prized DOXA diver’s watch – the watch that made him take the plunge into collecting. Dirk Pitt glancing at his DOXA’s luminescent dial and hands is a reoccurring scene that seared an image in James’ mind of the bright orange dial and large cushion case. Unaware at the time, a plot was developing in James’ life that would lead him to watch collecting and a subsequent career. But before that, James only had a superficial relationship with watches: He recognized watches by brand and appearance, but knew little else about them to distinguish one from another. Not until the passing of his Grandfather did James start to look at watches in a new light. He remembers his grandfather as a “man of taste” and someone who had a reason for everything: Like wearing a watch on the inside of his wrist – a holdover from his days in the Army, so the crystal's glare wouldn’t tip-off the enemy. James studied the watches he inherited as a way to explore his grandfather’s life - often wondering to himself: "Why THAT watch?" By piecing together stories that answered this question, he was able to better-understand his grandfather and, in turn, became inspired to take watches more seriously. Energized with a new appreciation for people's relationship with their watches, James decided to start collecting. 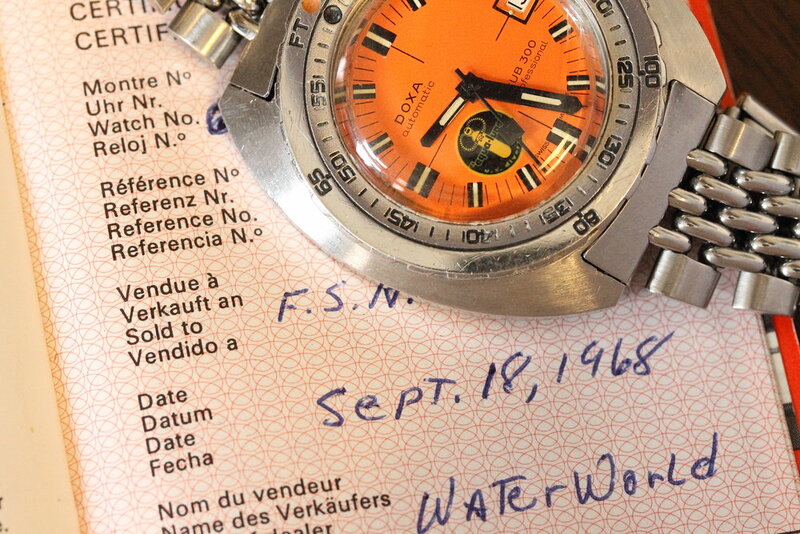 The first on his "hit list" was a watch he had the strongest relationship with: That orange dial DOXA diver’s watch he read about Dirk Pitt wearing on his aquatic escapades. 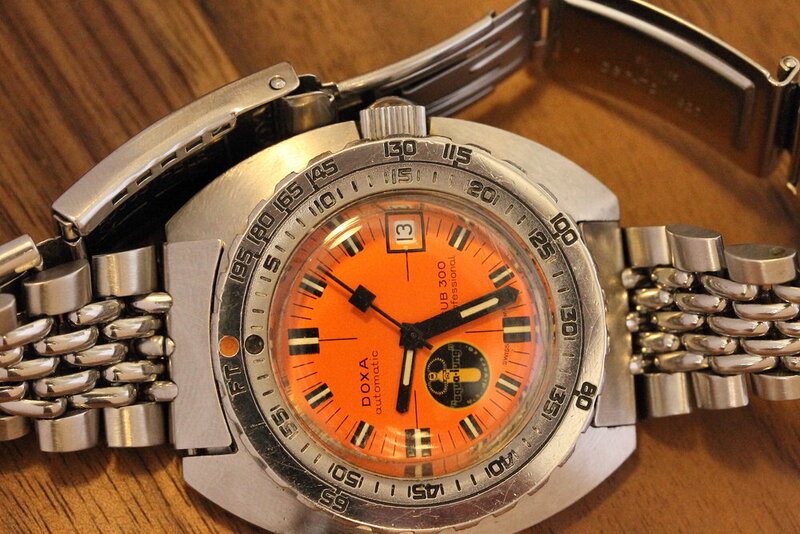 But finding a vintage DOXA Sub 300T - in decent shape - turned out to be harder than finding a shipwreck. You see, DOXA Subs were real tool watches. They were tested and approved by the godfather of diving: Jacques Cousteau. His company, U.S. Divers, distributed them exclusively to dive shops. Production was low, as was their survival rate. As analog/shift was establishing itself as a go-to source for watches, James’ ship started to come in: Several blogs featured his commentary on collecting. When he did have the podium, he never missed a chance to sing the praises of his favorite – underdog - diver's watch. Even Christie’s sought his testimony about DOXA. But - despite his knowledge on the subject - he was still searching for a quality example. After gathering the facts on the watch’s provenance and scrutinizing a very-grainy photograph of an orange dial with what seemed to be a black splotch in the lower-left quadrant, James was “optimistic” that this was the real McCoy: An uber-rare DOXA Sub 300 prototype - in other words - a "Black Lung." The gentlemen agreed to send the watch and its accompanying paperwork to New York for James to evaluate. For a watch produced in 1967 and tasked with handling extreme conditions, the watch - in person - was better than salvageable – it was practically a timecapsule piece. James' long-lost treasure had finally washed ashore. First off, they have a seasoned photographer on staff: Atom Moore - Instagram @atommoore. His headshots of analog/shift’s cast of watches are like department store window displays: thoughtfully composed with backgrounds and props that capture the spirit of the watch and make you fall head-over-heels in love. And since analog/shift is not your run-of-the-mill watch dealer, you get more than a serial number and a condition report for a description. David Shapiro - Instagram @dshap - pens a write-up for each watch that's downright poetic: Colorfully capsuling the history of the brand and model, as well as highlighting the particulars of the timepiece. Last but certainly not least is Jacob Sotak. He wears just about every hat at analog/shift: From authenticating watches to negotiating with strap suppliers. Basically, business would come to a screeching halt without him. James’ retrospection of his grandfather’s watches taught him everything he needs to know about the emotional side of wearing watches and collecting them. And after spending nearly ten years hunting down his DOXA Sub, he knows how important it is to find the right watch and how good it feels when you do. We all wish we could hop in a time machine and buy today's vintage watches when they were new. Since that's not happening any time soon, the next-best thing we can do is follow and visit analog/shift for the closest experience.